December 2016 - New Shipmates added in December 2016: Richard Burke 90 - 91. Check Crew List for details. December 15, 2016 - Added the names of the 32 deceased crew members I found on the USSVI web site. I was able to find obituaries on many of those shipmates. Some shipmates families however, decided not to publish obituaries for some reason so I have very little on their passing. Made some changes to the Eternal Patrol page to clean things up a bit. Hope you all have a Merry Christmas and a Happy New Year. December 7, 2016 - Learned of the passing of Plank Owner Eldon Ivy on November 16, 2016 in Connecticut. Eldon's obituary can be found in Eternal Patrol. 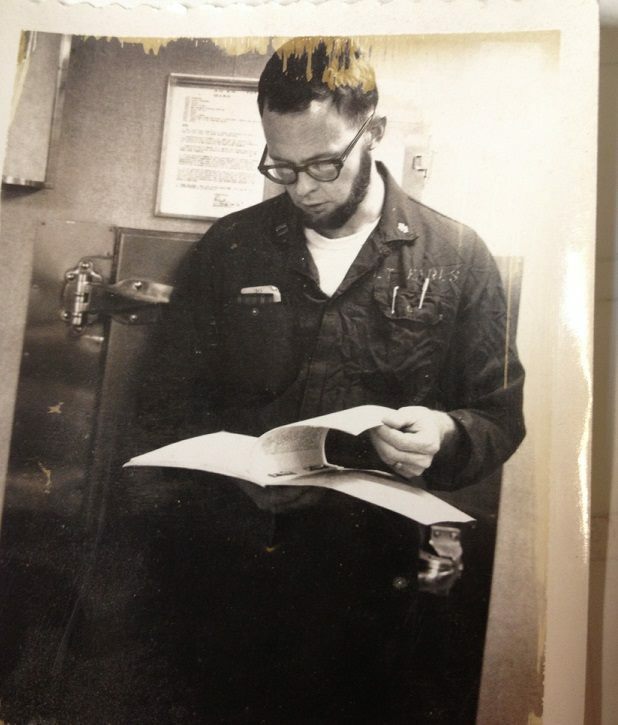 Ivy was a great guy and a great shipmate serving on the Key from 1965 - 1969. He will be missed. Rest in peace shipmate - smooth sea and a following wind. December 7, 2016: Today I was on the USSVI web site and noticed their Eternal Patrol page. It had a feature where you could insert a hull number and view any shipmates that were on their list. I did this and up came 91 Key shipmates. I compared this with the Eternal Patrol list I have been keeping on the SSBN657.com web site and found there were 32 names that were missing from our site. It is a bit overwhelming to see 32 deceased shipmates at one time. So, over the next few weeks, I will be adding these shipmates: Updated 12/15/16 - all have now been added to Eternal Patrol. William L. Perkins STSCS; Walter Barden ICC; William Max Allen EMCS; Robert A Jones STS2; Richard D Barker SKCM; O. Michael Mulkey ICCS; Richard M. Santos E5; William R. Harring MMCM; David J. Fletcher ETC; Clarence Lammers STCM; James B. Hurder EN1; Clarence "Gus" Knight YN1; Roy E. Hopf EN1; Richard A. Yoder EMC; James A. Lundell EN1; Thomas P. Broderick LCDR; Grover Ingram ICC; Peter Stanko RMC; Hugh M. Doherty CAPT; John R. Hazen STS3; Mill J. Fields EMC; Jon R. Sutton RMC; Roger H Shelp STCM; Bobby Joe Creamer MM1; Larry W. Vogt MMCS; George Franceschiello RMC; Ronald Lee Callis ETC; Robert E Sukow, jr ICC; William C. Wilson IV MT1; Donald Rice MS3; John R Toothman FTG2. I do not have information on most of these shipmates as to which crew they were on and what years they served. If you recognize any of them, please send me any details that you might have to Russ Christie at ssbn657@comcast.net. I hate to see an empty memorial area next to a shipmates name. To all these shipmates, their families and friends, please accept the deepest sympathies of the entire crew of the Francis Scott Key. We will do our best to respect and preserve their memories and accomplishments during their service to our country. Oars at rest gentlemen; job well done. November 2016 - New Shipmates added in November 2016: Earls, Jim 66 - 67 Plankowner; Harrison, George W. 75 - 78; Buffington, Frank 83 - 87. See Crew List for details. November 9, 2016 - Received an e-mail from Chris Earls notifying us that his father, Jim Earls, had passes away in 1990 and asked that Jim be added to the crew listing of the Key. Jim Earls was a blue crew plank owner and Medical Officer on the Key's first patrol. Jim's obituary can be found in Eternal Patrol. Our sympathies go out to his family and we thank them for bringing Jim home. Rest in peace shipmate - Job well done. Jim's picture is below along with his plank owners plaque. August 2016 - New Shipmates added in August 2016: Hallas, Kirby LCDR Active Duty 89 - 92 (was STS2 on the Key); Lucero, Ruben 88 - 90; Reidinger, Phil 80 - 82. Check Crew List for details. August 31, 2016 - Just received news of the passing of Lee Eubanks, plank owner, Quartermaster, 65 - 71 Blue Crew. Lee signed my qual card. We served two years together on the Key and was a sailor I always looked up to. He passed August 27, 2016 in Hampton, VA. I will add Lee to the Key's Eternal Patrol list once his obituary has been published. Ron Shouse noticed the announcement on Facebook, put there by one of Lee's grandchildren. Job well done sailor, and I can personally vouch for it. Rest in peace. August 31, 2016 - Shipmate Harry Baker just sent in this picture of his new license plate. It is a beauty. Florida obviously allows more customization than most states. Harry was a TM on the Blue Crew in the early 70's. June 2016 - New shipmates added in June 2016 - Davis, Ronald E. 67 - 68. See Crew List for details. June 22, 2016 - The 2016 Key reunion was a great success. Anyone who has pictures from the event can send them to ssbn657@comcast.net and they will be added to the collection. So far I have received a few pictures and they can be seen at Reunion 2016. The next reunion of the crew of the Key will be in 2018 in Branson, MO. April 4, 2016 - I searched the internet today and found several former Key shipmates that had passed away in the past year. Benjamin Bryan Covington late 70's, Richard M Medders 75 - 78? and Gary Darr 70's Gold Crew. I also found Christopher C. Philbrick who served on the SS Francis Scott Key in World War 2. How? 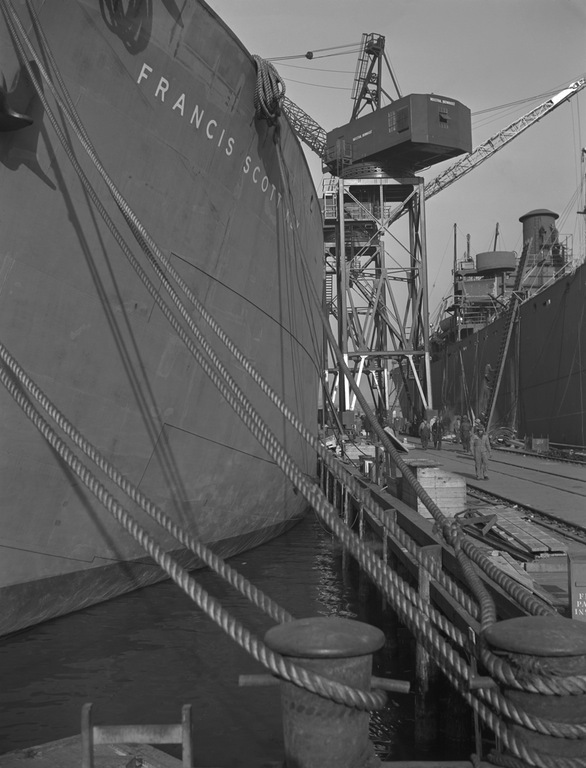 Well there was a liberty ship named after Key. Mr Philbrick was a gunner onboard the Key. Who knew? Well, I've added Mr Philbrick to our Eternal Patrol listing. I hope no one minds, as he served in WW2 and Korea and had a remarkable tour of duty. Just read his obituary in Eternal Patrol. To all these fine men, rest your oars sailors, job well done. 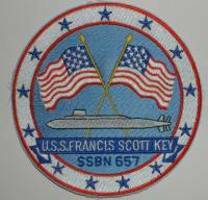 Below is a picture of the SS Francis Scott Key 0016. Google "The Murmansk Run" to read about the liberty ship S.S. Key. April 4, 2016 - I received an e-mail from a deceased shipmates daughter. She found some items in her father's gear that he said was from the Key. Her father had been an EM1 probably in the 85 - 92 time period. His name was Clifford Garland. 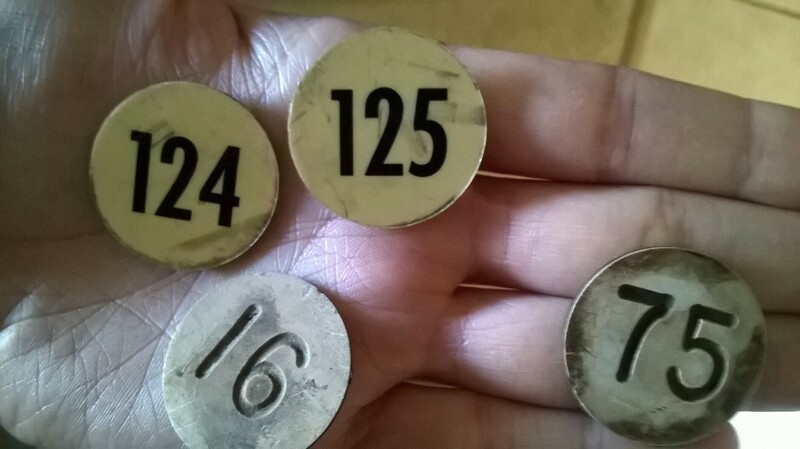 She would like to know what these are. If you know, drop me an e-mail at ssbn657@comcast.net. Her full e-mail is below the picture. March 2016 - New Shipmates added in March 2016. Frazier, Dr Daniel W abt 1970; Parry, Thomas L 68 - 71. Check Crew List for details. March 26, 2016. Recently received the news of the passing of two Key shipmates. Thomas L Parry was the Engineer on the Key 68 - 71 on the Gold Crew. Tom passed away just as few days ago. Also passing recently was Dr Daniel Frazier of the Gold Crew around 1970. We are not 100% sure this is the same Dr Frazier that served as medical officer on the Key so any confirmation would be appreciated. Our deepest sympathies go out to the families of these two shipmates. Their obituaries can be found in Eternal Patrol memorial are of this web site. Rest in peace sailors, job well done. February - New Shipmates added in February 2016. Allen, William R 75 - 77; Garza, Glenn 81 - 85. Check Crew List for details. January 2016 - New shipmates added in January 2016. Hansen, David L 81 - 84; Killian, Chris 79 - 81; Tompkins, Steven 89 - 91. Check Crew List for details. January 18, 2016 - Just received news of the passing of David L Hansen. Dave was the COB of the KEY during its second overhaul in Newport News. Dave's obituary is on his Eternal Patrol area. Our sympathies go out to his family and friends. Job well done sailor.